The swing to smartphones and more immersive experiences using apps is having a major knock-on effect with how mobile handsets now figure in our lives. The Mobile Mindset Study, a new survey from mobile security developers Lookout using data commissioned from Harris Interactive, has found that three out of five smartphone owners in the U.S. do not go for more than one hour without checking their devices. The report also contains some data that speaks to where our priorities are when it comes to our phones. Some 94 percent of people worry about losing their devices — with some 74 percent saying they panicked when they lost a phone in the past (and 14 percent describing their state as “desperate” and 7 percent as “sick”). But the main reason for that wasn’t a worry about the loss of personal details, but the cost, hassle and inconvenience of replacing it. While 38 percent complained the cost of replacing a lost phone and 24 percent said it would be inconvenient to lose it — combined for 62 percent — only 29 percent cited personal details, account information or inappropriate content as reasons to be worried when they lost their phone. That points to people either being more relaxed about personal information and security than some would think; or that people are not really storing so much information on their devices these days — or that they are unaware of how much they can contain. 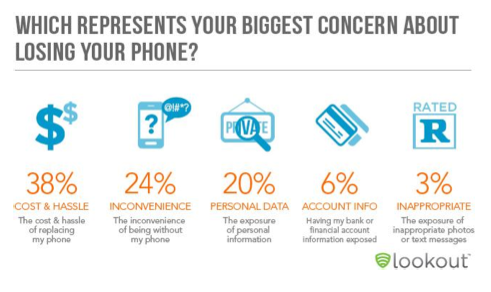 “We suspect that smartphone users out there banking, sexting and explicit picture-taking are, in fact, concerned about their financials and unmentionables being revealed, but our data reveals that they are more concerned with the time they would have to spend without their device and the money it would cost to get it back,” Lookout’s analysts write in the report. It’s a bit of an ironic conclusion, given that report commissioner Lookout’s app is geared towards users who want to track their devices if they get lost — and wipe them remotely if they cannot. The dedication to using one’s phone has also meant that we are using them everywhere. The most common place? 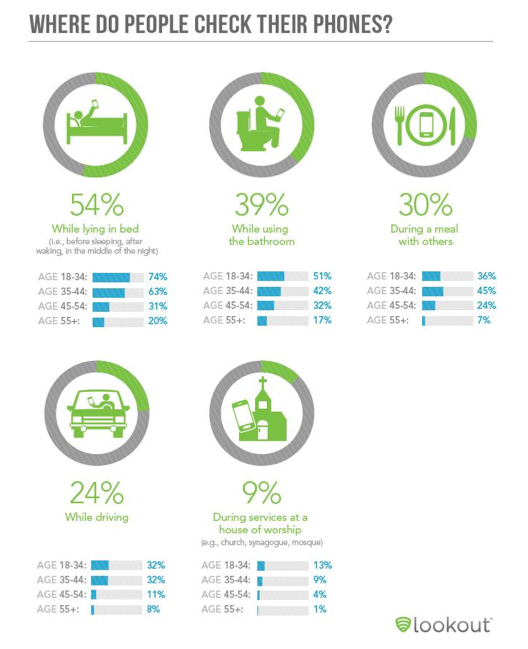 While in bed (54%), with on the toilet being a close runner-up (39%), and while eating in third (30%). As you can see, usage across different age groups varied, with those ages 18-34 being in general much more dedicated phone users than older people in almost every category where age was broken out. For example, the survey further found that while 58 percent was the average for one-hour phone checks, but for 18-34 year-olds the proportion was actually 68 percent. Similarly, men tended to have more emotional reactions to their phones when they disappeared, with men scoring higher than women in emotional responses. The Harris Interactive survey was carried out in the U.S. online among 2,097 respondents between May 8-10, 2012.